In Neal Stephenson’s famous science fiction novel Snow Crash, religion is presented as a kind of virus capable of rewriting the basic operating system of the human brain. With recent works such as T. M. Luhrmann’s When God Talks Back, the sense that religion re-writes the mind and its perception of reality has received new legs. (It’s an very old argument that can be seen in the works of Freud, Durkheim, and Marx.) What’s notable about Snow Crash and the point that Luhrmann and others have revived is that religion is a product of intentional effort. We may speak of religious experiences as emerging from places beyond reason, but institutions of religion are conscious creations. Religion rewires us. When we play at religion we get better at understanding the game we participate in and its rules. We are practicing our practice. That effort makes us adepts, experts, and professionals. The recent Twitch Plays Pokemon (TPP) phenomenon, which I wrote about last week, continues apace. It takes serious effort to follow TPP. It runs 24 hours a day as players around the globe control the game from their home computers. I manage to follow along only by the generous updates offered by community members online. The latest version of the game, Pokemon Crystal, took nearly two full weeks to finish. At every moment fans are creating new interpretations of the game and its awkward, halting game play. 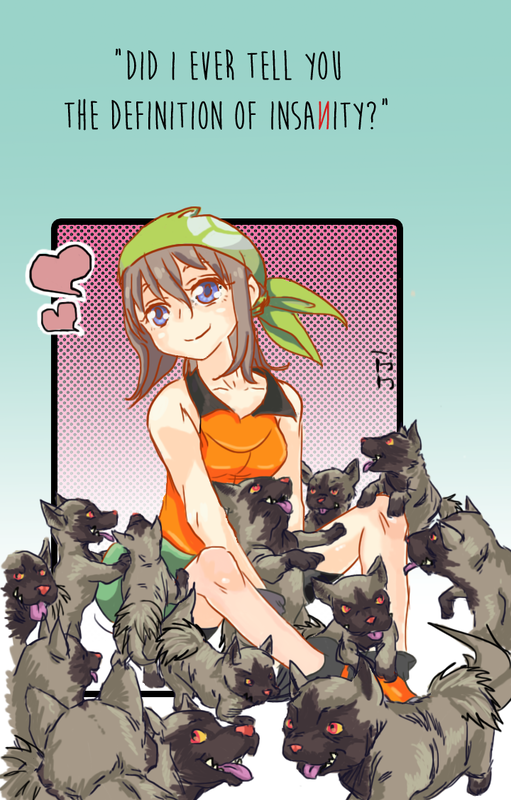 Fan art occupies more than half of the popular subreddit for TPP. Participants in TPP exert continuous forward pressure on the TPP mythos. They actively elevate the game play into the religious realm. It is their effort that spurs the complex narratives. And like a virus replicating in a healthy culture–TPP creates its world and in that effort has become more adept at creating that world. Much like the world occupied by the evangelicals Luhrmann describes (or the cult followers of Asherah in Snow Crash), this is an environment that nurtures itself. It is on this point of effort and conscious invention that I want to dwell today (as TPP begins its journey on the next game in the series, Pokemon Emerald). First, let me outline a point of pre-existing mythology in Emerald. 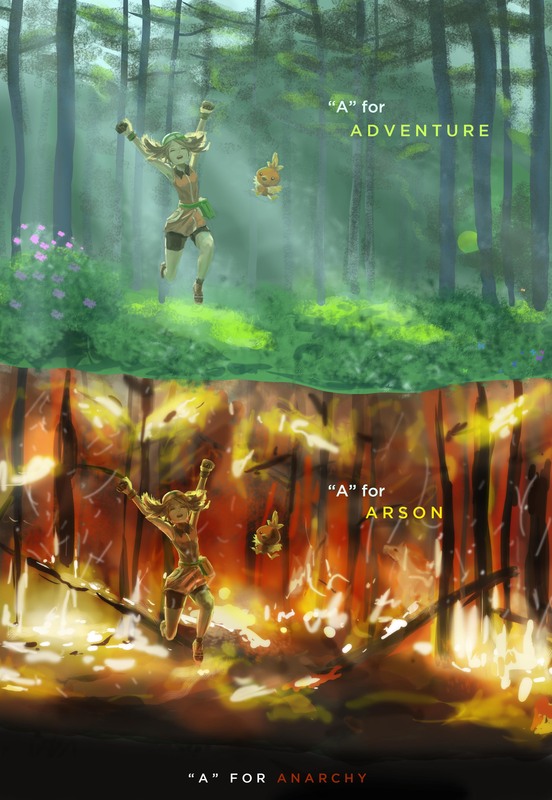 The world occupied by the protagonist has two major forces vying for control–Aqua and Magma. Team Aqua wants to expand the oceans of the world; Team Magma wants to expand the world’s landmasses. As a creative, productive force, magma is contrasted with the chaos that would emerge with a return to the sea. In the game both sides are ridiculous. They are the kind of bumbling evil that pervades Scooby Doo. As mythical forces, however, they are the division of earth and water. What’s missing is the tempering force of sky. The give and take of water/earth is an endless cycle. It’s a literal eternal battle, too, between two legendary Pokemon. Only a third force can break the stalemate that rocks the world. As fans of TPP brace themselves for the start of a new adventure, they already know several layers of mythology. Nearly every one of them will have played Emerald themselves. They will be aware of its pre-existing canon. So too are they aware of the canons of the games that precede Emerald’s myths within the Pokemon world (having played both Crystal and Red in TPP already). And yet there are further layers added from the playing of Crystal and Red in the community. The deities and myths that have been elevated in the last month are now givens for the new TPP world. I think the community is getting much more than they bargained for when they signed on for the first play through. The creative outlet that the game gave to its fans is now a recognized as one of the exercise’s benefits. It is as much an exercise in the formation of mythology as it is a social experiment about the limits of cooperation within a limited digital medium. Last week my brother asked whether I saw any religious studies potential in the affair. I replied immediately and without hesitation that I did see scholarly promise in TPP. Part of me sees the exercise’s contribution as time compression. Where else can you see the birth and evolution of mythology laid bare before your eyes with such precision? Another part of me recognizes that it is the virality of experiment and its memes that renders it immediately useful for religious studies. So often we lack a good case study to explain the way in which digital religious lives operate today. This is religion online as opposed to digital religion, I know, but I think there is a mix of both here that makes TPP so exciting. This post was set to post Friday, but some technological glitch held it up. Since the TPP Emerald game has already begun, let me say a brief word or two about the latest version. Users were initial struggling with the option of choosing a boy or a girl character. With no democracy mode in this play through–full anarchy mode all the time so every command is executed–the first hurdle appeared when a boy was selected, then a girl, and then a girl again. The failure to sustain the initial choice led the community to speculate on the psychological or even criminal events that might have led to the final selection. The following items, posted on Reddit, highlight these and other developments over the weekend, including the permanent release of the character’s starter Pokemon, the capture of multiple versions of a hyena Pokemon, and the repeated failures to make game progression due to a rock-paper-scissors battle that had the community in perpetual loss. After the community released Torchic, the Pokemon they started the game with, there was quite a lot of mourning. This comic, for instance, summarizes the complex emotions some of the community was feeling. And then folks started arguing that another pokemon, which evolves like a cicada and leaves a ghostly pokemon shell behind, was really hosting the lost Torchic’s spirit or soul. You can read more about that in this post which references the manga Fullmetal Alchemist. The sense of loss and anxiety is palpable, while the number of posts emphasizing a community in decline suggests the initial period of euphoria of the new adventure is wearing off and moving on to other darker emotions. Needless to say, it’s a wild time over at TPP Emerald. Recently, a social experiment in the form of a community effort to play a video game became the platform for the swift birth of a viral religious mythology. The details are complex, so let me take a few moments to get you up to speed on the details you need to know. Just as folks recently enjoyed watching full coverage of their favorite Olympic events, Twitch offers full access to gamers who are sharing their experiences playing games. Popular games such as DOTA2, League of Legends, World of Warcraft, Starcraft, and Diablo 3 have all been featured by major Twitch streamers. Monetization for the site and its content producers occurs through the display of advertisements and monthly optional subscription fees. Just as more YouTube videos are watched every day than all of cable and public access television, at some point in the future, it’s likely that the streaming experience will become another major form of content for media consumers. For serious (and even casual) gamers, Twitch is a normal part of today’s gaming experience. The best way to understand Twitch is to simply head to their site, pick a stream, and watch for a few minutes. I recommend whatever the stream is with the most views at the time when you open the site. Right now that’s 50,000 folks watching a professional competitive League of Legends player practice. Alongside the main window of Twitch’s content stream (where the game play is broadcast) there is a continuously scrolling bar of viewer conversation. These are often moderated (to prevent spam), but any Twitch user can post comments, questions, or whatever occurs to them to share with everyone else watching the stream. This chat window can be hard to follow because it posts continuously. With 10,000 or more viewers, stream chat windows can get nearly impossible to read as you might read any other kind of text. While some instinct in me says “don’t bother,” other instincts in me say to find a smaller stream to see the value of the text chat for devoted fan interaction with streamers. Within the mythology of the Pokémon world, one of the early games required players to choose between a pair of end-game pokémon creatures. The Dome and Helix fossils were mysterious pokémon believed to be extinct. During game play, players resurrected one of the two fossils, and could, if they so desired, add the pokémon to their collection. Now you have all the pieces you need to appreciate the way in which things have all come together in Twitch Plays Pokémon (hereafter TPP). Let’s get started. A few weeks ago, a “social experiment” began on Twitch that allowed the community to play through a game of Pokémon Red together. By entering commands into the live-stream chat window, players would be controlling the actions of the character in the Pokémon game. It was a complicated system featuring options for more or less chaos in the way the community controlled the game. In “anarchy mode,” commands inputted to the chat were executed by the game in the order they were received. As you might expect, this meant a huge volume of wasted commands. The character in the game spun in circles, opened and closed menus, dropped important items on the ground, released pokémon that it had caught, and so on. During the first TPP run-through of Pokémon Red, players began to speculate about the motivations of the game character for constantly entering the game menus. Consider this for a second. The way in which the community’s control of the game affected game play became an object of speculation for the community about why the in-game character would do such things. Why, they wondered, was the character always looking in the menus of the game? What did it mean? The “let’s go along with it” attitude is not especially odd for the group of gamers playing this game. Pokémon is at its core a role-playing game. Community participants in TPP were simply being good role-players by asking what the game was doing when its play seemed not to fit the established roles. (I’m trying so very hard to avoid using theory here, but obviously Geertz, Bordieu, Smith, Bell, Douglas, and others would have extreme relevance on this point.) They filled this gap–consciously, deliberately, and knowingly–with religious and mythological content. Toward the end of the game, after players had collected a Helix fossil, selecting the fossil in the inventory resulted in an error message that informed players they couldn’t yet use the fossil. In an effort to explain why the in-game character was consulting the fossil so often, players began to claim that Helix was a kind of deity to whom the character was turning. When the community finally turned the Helix fossil into a pokémon, all hell broke loose. 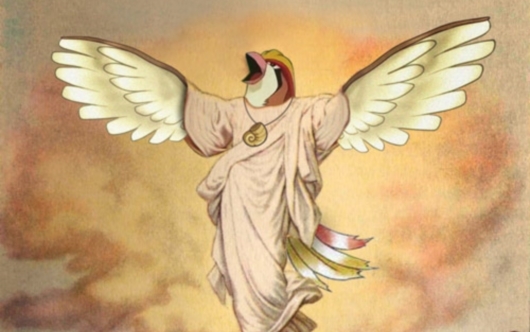 Lord Helix’s protector, Bird Jesus. Community members that rejected the choice argued that the un-chosen fossil was the real deity. A religious schism expressed the community’s lack of explanation for their collective game play. It was the backstory that game randomness meaning. And because they saw it this way, the deity Helix became an incarnation of the value of chaos. If you’ve come this far, you might be ready now to appreciate the kind of madness (in a good way) that this has spawned. Pokémon fans are nothing if not utterly devoted to their game. Their nostalgia and sense of play (in terms of role-playing) has created a serious virality of religious innovation that acknowledges pre-existing in-game content and real-life religious influences. Not only are their products syncretic–combining both real world elements and pre-existing franchise approved mythology–but they also have explanatory power over the community’s experience of the chaotic play-through. These are smart readers of culture and religion and they’re using that skill to create mash-ups that are just astonishingly inventive. Take this Reddit post by user aseanman27 as your gold standard. In it you’ll find an utterly fascinating image that details all of the steps and missteps of the emergence of TPP mythology. The image is enormous or I’d include it here, but stop reading right now and open the image. Really. Should it all make sense to you? Absolutely not. If it does, I can guarantee you were about 10 or 12 when pokémon came out and that you had access to a Game Boy Advanced or Game Boy Color. I’m actually working myself to get far enough into the game itself that I understand all the elements that make up this chart. I’ve got about 6 hours of gameplay on a iOS Game Boy Advanced emulator version of Pokémon Emerald that I understand far better the kinds of things happening on the stream than I did previously. Should you do that? Probably not. But I will be posting a series of explorations of the TPP mythology that delve a bit further into the convoluted fray. After all, upon completing Pokémon Red, the folks behind TPP jumped right back in again began another play-through of Pokémon Crystal. The mythology continues apace right this second. It’s not often we get to see even a pseudo-religious mythology arise. To see it happen over the course of the last few weeks has been astounding. If it has been too far out of your comfort zone to register, I hope I can help. Feel free to comment below on whether you’ve been watching, what you’ve seen, or to ask any questions that have occurred to you about this phenomenon. David McConeghy is a PhD. in Religious Studies specializing in contemporary American religious history, spatial theory, sacred space, and evangelical spiritual warfare.